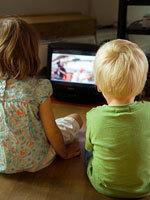 Young children who watch a lot of TV aren't just missing out on more stimulating activities. They may also be destined for problems at school and unhealthier habits later in life, new research suggests. MONDAY, May 3, 2010 (Health.com) — Young children who watch a lot of TV aren't just missing out on more stimulating activities. They may also be destined for problems at school and unhealthier habits later in life, new research suggests. Each additional hour of TV that toddlers watch per week translates into poorer classroom behavior, lower math scores, less physical activity, and more snacking at age 10, according to a new study in the Archives of Pediatrics and Adolescent Medicine. "Kids should be doing things that are intellectually enriching: playing with board games, playing with dice, playing with things that will improve their motor skills, reading," says the lead author of the study, Linda Pagani, PhD, a professor in the School of Psychoeducation at the University of Montreal, in Quebec. "All that is replaced by sitting on the couch." Is it Baby Fat or Obesity? Pagani and her colleagues followed more than 1,300 children for over seven years. Using parent surveys, the researchers measured the amount of TV the kids watched at age two-and-a-half, and again at age four-and-a-half. Then, when the children were in fourth grade, the researchers asked the kids' schoolteachers to rate their academic performance, how well they got along with peers, and how well they listened and followed instructions. They also asked parents about the child's diet and level of physical activity. These findings suggest that kids who watch too much TV are "learning to be just a passive receptacle," Pagani says. TV watching also appeared to have negative effects on physical health, with each additional weekly hour resulting in a 9% decline in overall physical activity, a 9% increase in soft-drink consumption, a 10% increase in snacks eaten, and a 5% increase in body mass index. The American Academy of Pediatrics recommends that children under the age of 2 watch no television at all, and after age 2 watch no more than one to two hours of quality programming a day. But nearly half of 1- to 2-year-olds and more than 40% of 2- to 3-year-olds are estimated to watch more than the recommended amount, the study notes. Next page: How does TV harm kids? How does TV harm kids? Pagani's study is merely the latest to call attention to the drawbacks of childhood TV-watching. A number of studies have linked too much TV to a range of negative effects in kids, including shorter attention spans, slower language acquisition, increased aggression, and weight gain. Experts have suggested several possible explanations for these findings. One theory is that time spent in front of the tube is time that could be spent on more enriching activities. As Jeffrey Brosco, MD, a professor of clinical pediatrics at the University of Miami Miller School of Medicine, puts it, "Every hour that you're watching TV, you're not talking to someone, not playing a game, not building something with your blocks." Another theory is that the act of watching television can harm developing brains. A child's brain triples in size within the first three years of life in response to external stimulation, says Dimitri Christakis, MD, a professor of pediatrics at the University of Washington and the country's foremost expert on the health effects of TV in childhood. "Early exposure to [television] can actually be over-stimulating for the developing brain, and that can lead to shorter attention spans [and] cognitive difficulties," says Dr. Christakis, the author of The Elephant in the Living Room: Make Television Work for Your Kids. The rapid edits and quick sequences found in many of today's TV shows may be especially harmful in this respect, Dr. Christakis adds. "The hypothesis we have is that this conditions the mind to expect high levels of input, and by comparison, reality is boring—it doesn't happen fast enough," he says. Yet another possibility is that the negative effects of TV that have been reported in studies are in fact a symptom of broader family and household dynamics. In the new study, for instance, the children whose mothers were less educated and children from single-parent families tended to watch more television. Although Pagani and her colleagues controlled for these and other factors in their analysis, household habits can shape studies like this in ways that can be difficult to tease out. "It's always possible that what you're measuring is not TV itself, but families that are more likely to let their kids watch TV versus families that don't want them to watch TV, or maternal education," says Dr. Brosco. "No one really understands what the effects of TV truly are, but so many studies—like this [one]—suggest TV is just plain bad for you." Watching television isn't necessarily harmful, however, and it doesn't have to be a mindless activity, says Dr. Christakis. He points out that Pagani and her colleagues did not ask about the specific programming that kids watched, which may weaken the findings. "The results of this study probably in some ways misrepresent the reality," Dr. Christakis says. "Studies that we've done find that what kids watch—and how they watch—is as important as how much they watch." Dr. Christakis believes that children should watch no more than an hour of television a day at any age. But, he says, parents should distinguish between mind-numbing cartoons and educational programs such as Sesame Street. "Parents need to know that the best-quality shows have a curriculum," he says. "They're trying to teach your child something, anything from the letter k to skills like how to share or how to handle a conflict." According to Dr. Christakis, the best way for young children to watch TV is with a parent. This allows parents to use potentially negative content (such as violence or advertising) as a learning experience, and also provides an opportunity to engage with the children and reinforce the message of educational shows.